A rugged drafting-height chair with a polyurethane seat and backrest that is built to withstand heavy use in labs and other work environments. * Will resist punctures water and most chemicals. * Comes complete with a height-adjustable 18" diameter chrome foot ring. 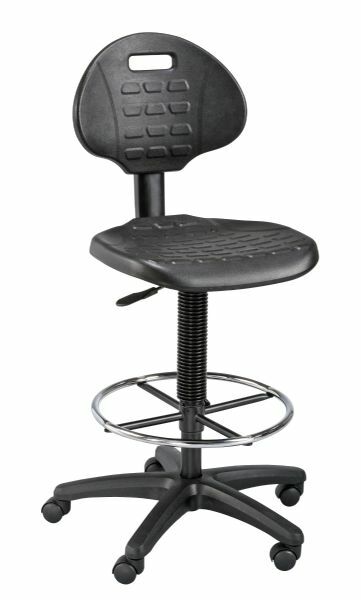 * Features include pneumatic height control with an adjustment range from 23" to 33" a height- and depth-adjustable hinged backrest and a 25" diameter reinforced nylon base. * Seat is 18"w x 18"d x 1½" thick. * Backrest is 17"w x 12"h x 1" thick. * Includes a set of non-locking casters and a set of floor glides. The seat material is polyurethane.